There is a lot to be said on dressing for weddings, and in fact entire books have been written on it. For now, I’m going to cover three topics that I find my clients most concerned about dressing for weddings: tuxedo suggestions, dress code interpretations, and trends in formal dress for women. 1. 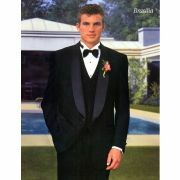 Formal tuxedos are either black or midnight blue, in a solid or tone-on-tone fabric. Tuxedo jackets can have peak, shawl or notch lapels, with peak being the most formal. Peak or shawl collar jackets feature one-button; notch can have one or two. The lapels will be satin (more formal, requiring a satin bowtie), or grosgrain (textured and less formal). No vent, or a double vent is preferable to a single vent. Tuxedo pants are always flat-front, and do not have belt loops. Wear suspenders, but not a belt. The pants have a narrow satin (or grosgrain) strip going down the side and should have a slight break. They are not cuffed. A tuxedo shirt is white with French cuffs and button openings for studs. Personally I prefer a pointed collar to a wingtip. A vest or cummerbund is a nice but optional touch. A black bowtie or tie, white pocketsquare, and flower boutonniere are the perfect finishing touches. 2. Dress codes are often stated on invitations, but can require some interpretation. The most formal dress code (in common use) is black tie. This is a request for men to wear a tuxedo, and women to wear a long formal gown, or short, dressy cocktail dress. An invitation stating Formal Dress, or Black Tie Optional indicates that a dark suit with a white shirt and tie for men is fine, but a tuxedo is appropriate as well. Women can wear a gown, shorter dress, or dressy suit. Semi-formal or Dressy Casual options will depend on the time of day, and venue. I would suggest a suit or sport jacket for men, a dress or skirt and top for women. White tie, beachy casual and casual dress are other options. 3. Trends in formal dress for women include strapless and one-shoulder gowns, midi-length, and shorter-in-front, longer-in-back styles. Embellishment is big, whether it’s ruching, lace, pom-poms, or attached flowers. 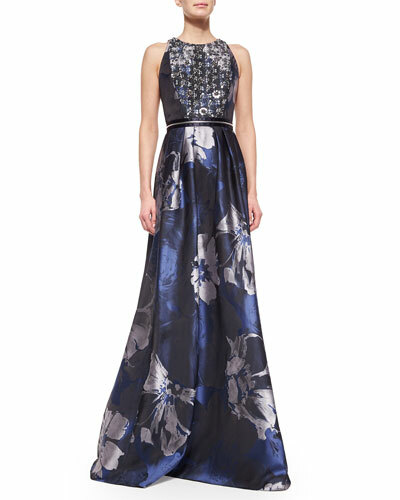 Fabrics are rich shiny satin, tulle, and organza, or a blended jacquard. Colors include the usual neutrals such as black, and bone or beige, but also a lot of blue, with navy, periwinkle and teal showing up. Gold, silver and pewter are other options, and if you want to make a dramatic appearance you can always opt for red. In conclusion, formal wear for 2015 tends to be conservative, but not boring. Women’s trends seem to be influenced by the Chinese exhibit at the Metropolitan Museum. (China Through the Looking Glass) Looking rich and elegant is in style, but doesn’t have to cost a fortune.